We live in a world full of dos and don’ts. No matter what we do, we’re expected to observe the traffic regulations, savoir-Vivre rules, table manners, or the office dress code, which limits the clothes we can wear. The world of interior design is no different. There are plenty of guidelines telling you how to arrange a space so that it looks as best as possible. However, we believe that some rules are meant to be broken. Going off the beaten path will help you create an interior like no others. But how far should we go? Interior design, like fashion, can be played around with. Your home should reflect more than just the current trends. It should mirror your character and personality. Only then can you create a space in which you’ll truly feel at home. Naturally, we’re all different and the diversity should be visible in the arrangement choices we make. That’s exactly why it’s more than acceptable to let your imagination run wild and break a few of the rules that used to limit you. Here are five rules that you should simply ignore! If you decide to arrange your living room according to an established esthetic – be it Scandinavian, industrial, or retro style – you’ll surely achieve the effect of coherence and harmony. It’s the fastest way to arrange an apartment. However, if you wish your interiors to be unique, you have to be ready to experiment with contrasting styles to create daring combinations. But won’t such a mixture turn sour? Of course not. Just remember not to go overboard. Use the space available to you at the moment. 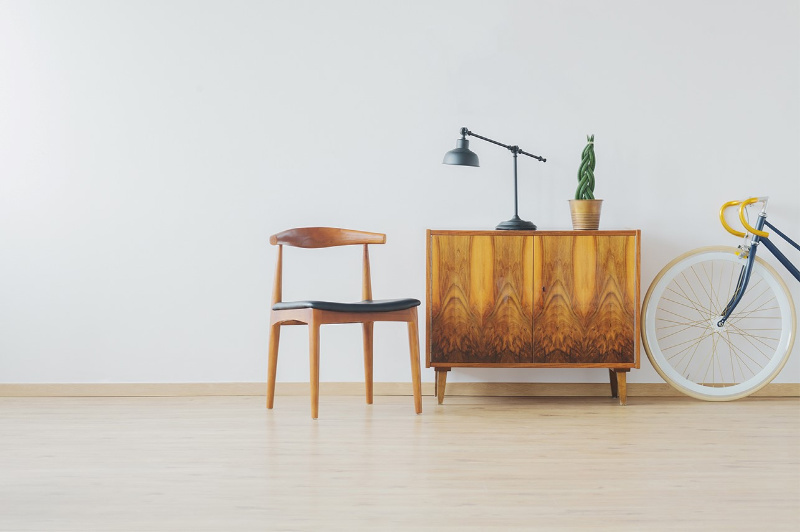 If you have a modern, minimalist décor, introduce some diversity with vintage accessories. What kind? 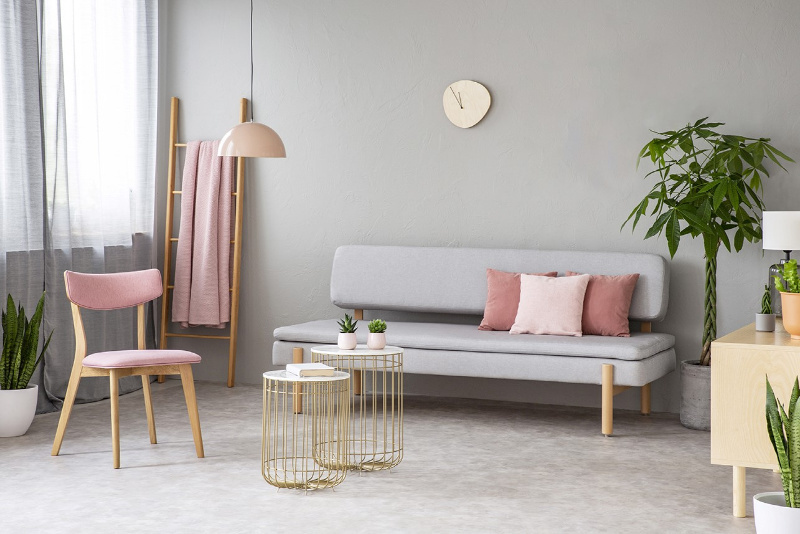 For example, an iconic “Balloon” chair designed by Hans Olsen, one of several armchair models designed by Erik Kirkegaard, a hand-made kilim for your wall, a floor lamp with a colorful shade, or a mid-century modern style wall mural for the living room. On the other hand, a classic room can use some modern accents. What sort? A modern coffee table, colorful poufs, an expressive abstract painting, or the famous “Louis Ghost” chairs inspired by furniture of Louis XVI but made of transparent plastic. It would seem that the best way to decorate cozy interiors is using light color schemes. Although that’s not untrue, there are definitely more possibilities. In fact, if you arrange a room based only on shades of white, it’s going to turn our lackluster and without character. An interior with no dominant colors is often perceived as boring and uninspired. If you wish to optically enlarge the space, it’s a much better idea to use a spatial 3d wall mural for the living room. These original patterns create an illusion of depth and make even the smallest spaces appear bigger. 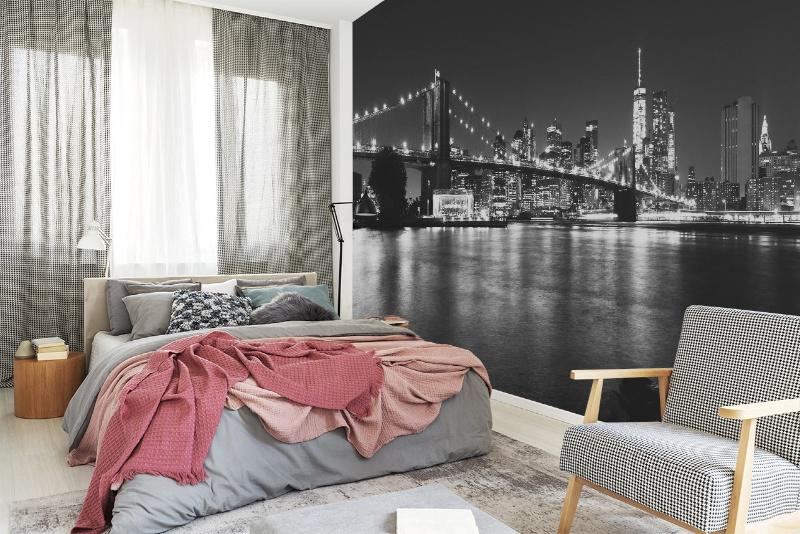 The variety of designs is also incredible: you can choose a picturesque landscape, a spatial relief-like pattern, or a panoramic view of a famous metropolis. 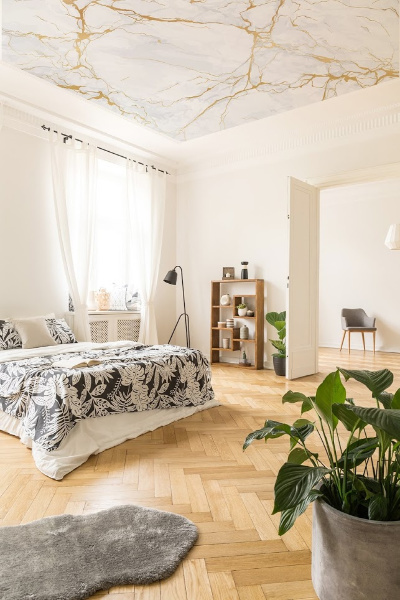 It’s a well-established tradition that no matter how colorful the interior is, the ceiling is left white or painted a neutral color. Truth is, this rule only has to be followed if the ceiling is really low. Otherwise, consider making good use of the space above your head with a stunning decorative design. A wall mural for living room can be used to beautify more than just walls, although that’s its main function. You may wonder what kind of image would work well on the ceiling. Contrary to what you may think, there are quite a few possibilities. You can use a depiction of a clear blue sky with fluffy clouds, the vault of a historical palace, a colorful mandala, or even an imitation of precious marble with a dazzling golden encrustation. Finally, for a child’s room, you can use a cosmic image of a colorful, revolving galaxy. One of the many myths circulating in the world of interior design says that pink is only suitable for infantile, girlish arrangements. On the contrary, we believe that an appropriate shade of this color is perfect also for the living room. One excellent argument supporting this idea is the fact that The Pantone Color Institute has chosen the incredibly energetic Living Coral as the color of the year 2019. The hue of exotic coral reefs will help you liven up the arrangement, but it will also make the interior appear more cheerful. The way in which you introduce the color into your design depends only on your imagination. You can, for instance, use a 3d wall mural for living room with its expressive, spatial pattern. Other ideas include an armchair with coral upholstery or a similarly colored carpet. In addition, you can consider using self-adhesive stickers to change the look of your cabinets and make sure they follow the latest fashion. What is the hallway for you? A place that you pass through. You’re only there for a few minutes every day when you’re putting on your jacket or taking off your shoes. If so, is it worth decorating? Yes, because the hallway showcases the character of your home. It’s the first place that you and your guests see upon entrance. It’s much more pleasant to come back home if you’re surrounded by beautiful decorations as soon as you step in. If you have more time to transform your hallway, consider using a 3d wall mural to visually enlarge the space. 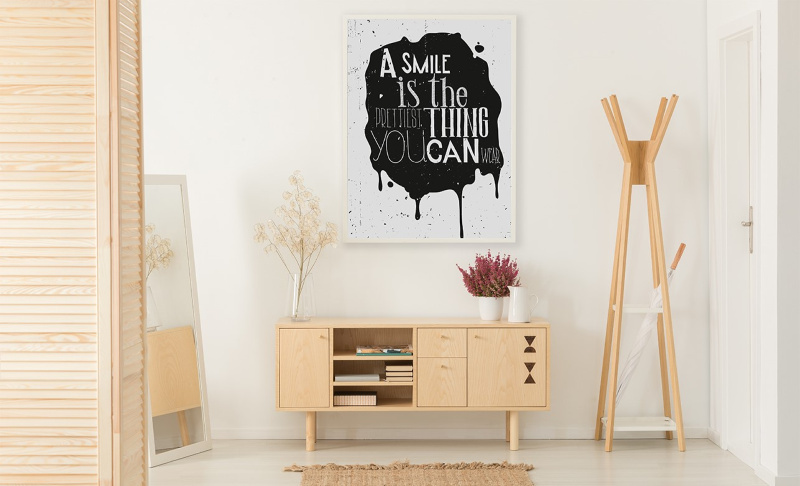 However, if you’re looking for an immediate effect, hang a typographic poster with a positive message on one of the walls and complement it with an original coat rack. It doesn’t have to take much money or effort to make an ordinary room look gorgeous. In fact, you can accomplish this task without leaving your home thanks to online shops like Myloview. A well-designed interior has to reflect the personality of the people using it. That’s why, instead of stubbornly sticking to the established rules, it’s better to find your own path that’ll take you straight to your dream arrangement. Some rules are meant to be broken, so don’t be afraid to seek brave and unique solutions! Previous Post: « Bring Some Sparkle To Your Life With Sunshine & Glitter!